Ruckus Media Children's BTS app sale! Do you or your child own an iPad, iPhone or iPod Touch? If you answered yes, you have to check out Ruckus Media's HUGE back to school app sale! From August 26th through Labour Day weekend until September 7th all 15 fantastic Ruckus Media learning app titles are on sale through iTunes for only 0.99 cents! 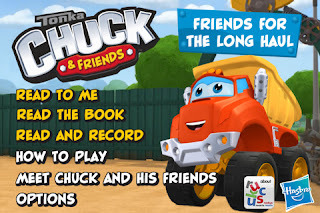 You can get fantastic titles like Chuck and Friends - Friends for the long haul, A Present for Milo, Spot the Dot and Andrew Answers among many more, for a fraction of what they are normally sold for. We all can agree that kids apps can help keep the kids occupied on a weekend road trip! Each Ruckus Media app features distinctive interactive elements that allow children of all ages to experience the story through an array of sensory driven activities. Head on over to iTunes and check out the Ruckus Media Library of children's entertainment, with this sale - you won't be disappointed!